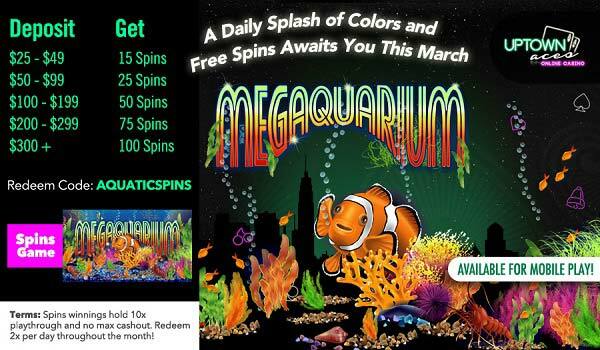 100 Free Spins and Underwater March Wins! The marine life in Uptown’s underwater bed will be clearer than ever this Spring when you deposit $25! This new season you’ll be on your way to a colorful world – Uptown’s richest sea of wins! Spin Megaquarium’s 5 reels where the wild symbol on reels 1 and 5 and will trigger 7 free games with doubled prizes. Moreover, the Bonus Games symbol appears on reels 1, 2 and 3 for extra subaquatic wins! Dive into a fresh new season and you’ll enter a new aquatic era of wins with your deposits of $25 to play with up to 100 Megaquarium spins!